The final sums have been calculated and Automated Intelligence is delighted to say that we raised £6813.48 for Cancer Fund for Children last year. 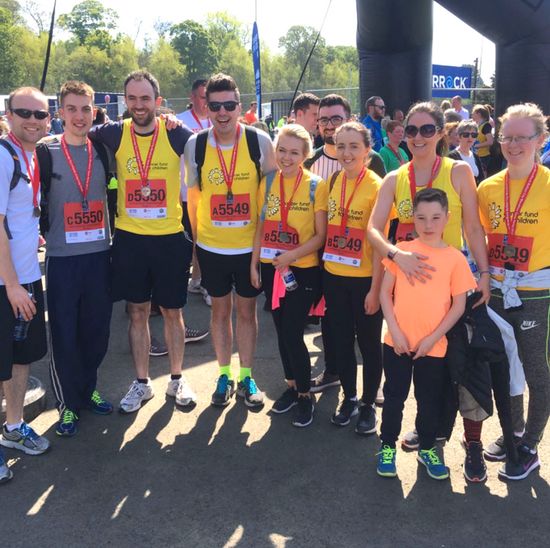 The Charity was our nominated charity for 2017 and our focus for fundraising throughout the year… At Automated Intelligence we’re proud to have a team of people who are always ready to rise to the challenge and help fundraise. We took part in the Belfast Marathon and sent a team of daredevils to abseil from the Europa Hotel. And all for a good cause. Every penny raised by these intrepid endeavours is then kindly matched by the company, ensuring that we can give as much money as possible to our nominated charity of the year. Cancer Fund for Children is a leading local charity in Northern Ireland. They have been helping families affected by cancer for 40 years and continue to offer invaluable support today. As part of their work, they provide practical, emotional and financial support to children and young people aged 0-24 affected by cancer. Through their charity, which also provides help to families, they offer therapeutic short breaks at their facility “Daisy Lodge”. Additionally, self-catering breaks are offered by the service. As they are not government funded, every penny raised goes directly towards helping continue this vital respite to children living with cancer and their families. Cancer affects so many of us, Every week in Northern Ireland, another three children, teenagers or young adults, aged between 0-24 years old, are diagnosed with cancer. So the opportunity to raise vital fund for a local charity working to help improve the quality of life of cancer suffers was not to be missed. We’re thrilled to have helped raise funds for Cancer Fund for Children throughout 2017 and look forward to seeing all the excellent work this charity continues to deliver in the future too.